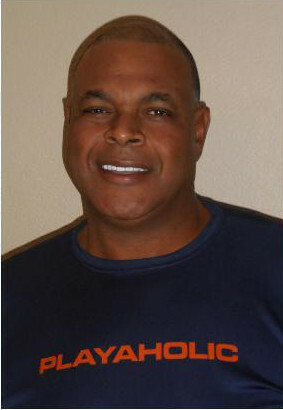 Marsharne Graves, former professional player for the Denver Broncos (1984-1985) and Indianapolis Colts (1987), has taken several journeys in his post-football career.In May 1999, Graves completed his undergrad degree at Arizona State University and received a Bachelor of Arts in Political Science. After a short stint working in the juvenile court system, as well as in the public school system, he decided it was time to continue his education and pursue a graduate degree. In June 2014, he graduated from American Public University (APU) with a Master of Science in Sports Management. Most recently, Graves was recognized by APU and the National Football League Player Association as an Ambassador for being the first retired or active professional football player from the NFL to ever graduate with a Master of Science in Sports Management from APU. PLAYAHOLIC performance wear t-shirts are designed for both the athlete and nonathlete in mind. Our performance wear t-shirts are made from the following materials of polyester, spandex, and cotton. Constructed here in the U.S.A. our performance wear t-shirts are designed to feel lightweight, roomy, and comfortable with the goal in mind of controlling sweat during workouts at the gym playing basketball, lifting weights, racquetball, running, spinning, stretching, Zumba and other high-intensity exercise regiments workouts. Available in different colors, sizes, and styles to choose from in short sleeve, long sleeve and sleeveless for men, women and kids alike.